Prominent & Leading Manufacturer from Mumbai, we offer chemical process centrifugal pumps, centrifugal process pumps and chemical process heavy centrifugal pumps. We are well-known manufacturer and supplier of an exclusive range of Chemical Process Centrifugal Pumps. We value quality and that give us good results in our business. These chemical process centrifugal pump set can be availed from us by our valuable clients at competitive market rates. The laminations are non-oriented silicon steel & confirm to IS-648. The electric motor is pressure die cast & uses electric grade aluminum. Better insulating materials are used so that pumps can withstand high-temperature rise. Being a customer focused organization, we are engaged in manufacturing and supplying a wide assortment of Centrifugal Process Pumps manufactured using optimum quality material and sophisticated technology. They are machine-checked at par with the defined parameters of the industry for flawlessness and accurate work. Keeping in mind the industry set standards, we are offering them in diverse specifications as suited to our esteemed customers. Pressure boosting for high rise buildings, hotels industry etc. Bare shaft pump ideally designed for clear water circulation. The back pulls out design enables the user to easily maintain the pump without distribution the pipeline. Single stage bare shaft pumps are in according to ISO 2858 & DIN 24255. Standard flanges are PN 16 as per DIN standard EN 1092-2 and PN 25 as per DIN standard EN 1092-2. ANSI 125 and ANSI 250 as per ASME B16.1 are available on request. The pumps are nonself priming horizontal end suction pumps with axial suction port and radial discharge ports. Standard flanges for suction and discharge ports will be PN 16 as per DIN standard EN 1092-2, PN 25 as per DIN standard EN 1092-2, ANSI 125 and ANSI 250 as per ASME B16.1 are available on request. Performance and dimensions comply to ISO 2858. These pumps are long-coupled pumps with TEFC squirrel cage induction motor with main dimensions complying to IEC standards and mounting designation B3 (IM 1001). 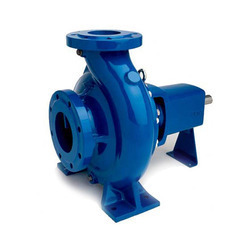 These pumps are available with gland packing as well as a mechanical shaft seal. 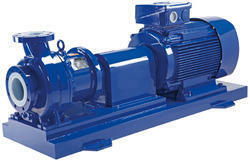 These pumps and motors are available with fabricated steel base frame according to EN 23661. 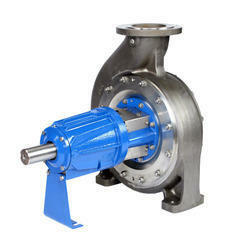 These pumps are available with our standard range of motors complying to EFF2 motors. They can also be supplied with EFF1 motors on request. These pumps feature the back pull-out design. As shown in fig. 1 the user can remove the motor, bearing bracket and impeller for servicing without disturbing the volute casing and the suction & delivery pipes. We have carved a niche in manufacturing, supplying and export of a huge gamut of Chemical Process Heavy Centrifugal Pumps. These chemical process heavy centrifugal pumps are manufactured with utmost care and perfection to give a trouble free and efficient performance. We offer these chemical process heavy centrifugal pumps at affordable rates. Built-in motor protection, dry running protection.